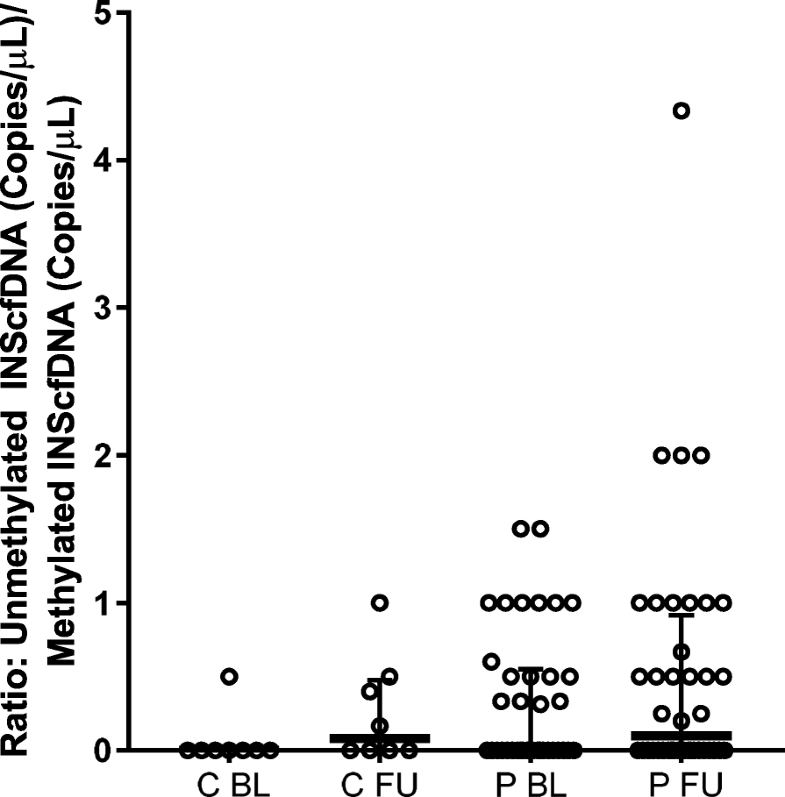 The abundance of insulin cfDNA that is unmethylated at the − 69 position of the Insulin gene has been suggested as a biomarker of β-cell death, as this site is unmethylated in insulin-producing islet β-cells but methylated in non-islet cells [6–8]. Methylation of a certain genomic region is generally regarded as a deactivation mechanism, and is conducted by DNA methyltransferases (DMT) that catalyze the addition of a methyl group from S-adenosyl-methionine to the carbon in 5′ of cytosine residues in cytosine-phosphate-guanine (CpG) dinucleotides . The active, unmethylated form of the insulin gene from β-cells is presumed to be released into the circulation from dying/dead islet β-cells . Therefore, the amount of circulating unmethylated cfDNA would be a reflection of β-cell death, while methylated cfDNA is suggested to be a marker of cellular stress and death of cells/tissues that do not transcribe insulin . An intense search for methods to quantify methylated and unmethylated insulin cfDNA is ongoing, as it would enable us to diagnose Type 1 Diabetes (T1D) and β-cell destruction before the loss of a significant number of insulin-producing cells. A crucial step in this process has been to identify CpG-sites within the insulin gene that are unique to islet β-cells. There are different approaches to this issue and no consensus of which sites and methods to apply [10, 12, 13]. Third, PCOS is a heterogeneous condition – there is variation within the group mainly explained by the syndrome definition of PCOS [1, 32], but also variation over time caused by e.g. pregnancy or interventions in lifestyle [33–35]. Some studies show that the different PCOS phenotypes differs in cardiometabolic risk, with the highest risk in hyperandrogenic and anovulatory phenotypes [4, 5]. However, we did not detect any differences in unmethylated or methylated INScfDNA neither at baseline nor at follow-up in a subanalysis of PCOS phenotypes based on Rotterdam criteria (data not shown). Further, the cohort was recruited when referred to assisted reproductive treatment (ART), and as a standard procedure, all PCOS women with a BMI > 25 are asked to initiate lifestyle interventions. Looking at weight only, the control group increased theirs during FU, while the PCOS group did not. The steady weight in the PCOS group could be interpreted as an alteration in general lifestyle. The fact that our cohort is recruited prior to ART, could also have caused selection bias, as those women with need of ART possibly are challenged with a severe PCOS phenotype. Moreover, our participants were relatively young at the follow-up time point in terms of developing insulin resistance, prediabetes or T2D. The effect on INScfDNA methylation pattern could have been more pronounced if the participants were older or if the follow-up time had been longer. Another explanation to the negative results is a possible effect of PCOS status on liver function or the use of metformin in the PCOS women. PCOS women are known to have an increased risk of developing non-alcoholic fatty liver disease (NAFLD) , and although there is no studies on NAFLD and INScfCNA counts, one study have indicated that the presence of autoimmune hepatitis has a decreasing effect on levels of methylated and unmethylated INScfDNA compared with controls . This could cause an underestimation of the differences between the groups and thereby our results. The use of metformin could also be a confounder in our study. There are no studies of the effect of metformin on INScfDNA counts, but insulin treatment in newly diagnosed T1D is shown to reduce both methylated and unmethylated INScfDNA significantly . If the effect of metformin is similar, use of metformin in the PCOS group could also cause an underestimation of the differences between the groups. Unfortunately, we have no reliable records of the metformin use in our cohort between baseline and follow-up. Finally, one could argue that our sample size, and especially the control group, is too small. This study was designed with an assumption of that, in a PCOS cohort aged 30–40 and BMI > 25, the prevalence of prediabetes (IGT or IFG) would be approximately 40–45%  at follow up. The prevalence in our cohort did not fulfill this assumption, as only 17.5% of our PCOS cohort was prediabetic, causing very low power. If the prevalence had been as expected, the power would had been acceptable. The lower number of participating controls resulted due to a recruitment issue, which might cause an underestimation of the differences between PCOS and controls.